New Year’s Eve is called Silvester in Germany (as well as a few other parts of Europe) and comes with a whole host of traditions that were new to us. The most obvious (and loudest!) was the prevalence of firecrackers and fireworks. If the number of fireworks shops that popped up in the days leading up to 31 December wasn’t enough of a hint that massive explosions were on their way, the fluorescent packages blazoned with names like ‘Skypainter’ and ‘Power Bang’ certainly tipped us off. I was surprised that Berliners of all ages are into fireworks; in Vancouver playing with publicly-available explosives is mostly left to teenagers. Not so in Berlin – everyone appears to love them here. The day before New Year’s Eve, our grocery cart seemed to be the only one without munitions. My husband went for a run late in the afternoon on Silvester and returned with reports of people launching fireworks off balconies and casually tossing lit firecrackers out of windows. It was barely twilight and already the streets were alight and all safety precautions had been discarded. We were hoping to duck most of the celebratory craziness (we’re not big NYE partiers and firecrackers make our dog, Sofie, exceptionally anxious) and had planned a quiet evening. Curiosity and the noise from the street, however, drew us outside about half an hour before midnight. The smell of gunpowder hit immediately outside the building door. Sparkly streaks broke through the smoky haze accompanied by an auditory assault of cracks, pops, and bangs. The street was crowded with revelers (most of whom carried bottles of booze and sticks of fireworks), with more arriving by the minute. We’re quite close to a train bridge with clear sightlines to the large fireworks display at Brandenburger Tor, which attracted a large enough crowd to temporarily turn the bridge into a pedestrian-only crossing. (Berlin has a huge public Silvester celebration with more than a million people and massive fireworks.) People were lighting fireworks set in empty bottles or pushed into the ground and there were explosions everywhere. All before the end of the year had actually happened! It was overwhelming and, truthfully, more than a little scary. Returning to the safety and sanity of our flat, we heard the world explode at midnight. The near-constant bangs continued for at least an hour, with sporadic firecrackers going off fairly frequently for the next full day. It was such a change from New Year’s Eve in Vancouver (relatively quiet and with far fewer fireworks) and explained why I’ve heard Europeans complain that Canadian celebrations are boring. As if the insanity of the local Silvester celebrations wasn’t astonishing enough, the aftermath raised the shock level even more. Generally, our neighbourhood is quite clean. There’s graffiti, of course, and more dog crap goes unscooped than desirable, but the plethora of civic garbage cans keep litter at a minimum. 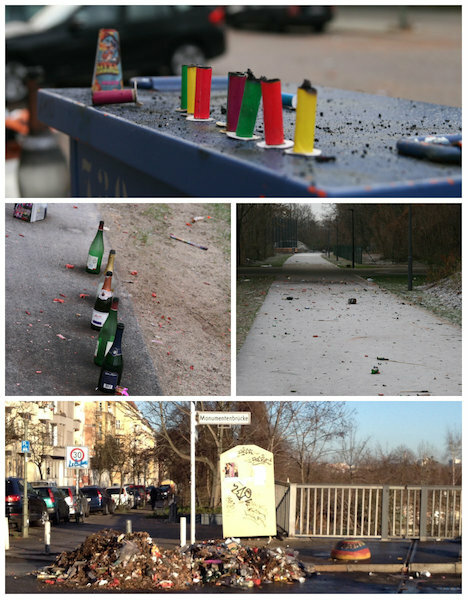 The morning of New Year’s Day, however, the sidewalks were covered with bottles, streamers, cups, and the remains of all the firecrackers and fireworks. So much for the German reputation for neatness and order! Amazingly, there didn’t appear to be any property damage. Vehicles parked along the bridge were stacked with bottles and people had used their fingers to write messages in the frost covering a few of them, but there were no broken windows or punctured tires. Parts of the pavement were charred by fireworks, but no trees or buildings had been set on fire. As we walked Sofie on the morning of 1 January, there were a few people gathering up some of the garbage (including a family who looked like they’d made it into a game for their young sons), but mostly people just ignored the mess. The clean-up started more earnestly on the second day of 2014 and continues today with street sweepers out in force. There are large piles of Silvester debris (shown in the lower image above) awaiting pick up and most of the broken glass has been swept away. Our neighbourhood is getting close to being clean again and I heard no firecrackers at all while walking Sofie this morning. My astonishment at the scale of the celebrations and the immense mess left behind, however, is going to take a little longer to fade.